No one has yet observed the first stars that formed in the Milky Way. In all likelihood, they will never be directly observed, because the first stars are massive, ending their lives only a few millions years after their birth. But, astronomers can study those oldest stars by examining the elements these stars produced through nuclear fusion and the supernova explosions that mark the spectacular ends of their short lives. 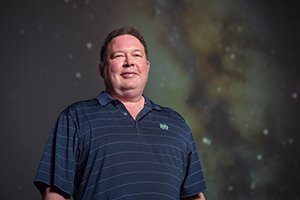 Timothy Beers, the Notre Dame Chair in Astrophysics at the University of Notre Dame, is part of a team that has used the Cosmic Origins Spectrograph (COS) on the Hubble Space Telescope to study key regions of the ultraviolet (UV) spectrum of a star thought to have been enriched by elements from one of the first generation of stars. This star, named BD+44 493, is the brightest known second-generation star in the sky. While examining its UV spectrum, Beers and his team detected several elements that had never been seen before in such a star. Their findings were published Monday (June 20) in the Astrophysical Journal Letters. Beers and his team detected phosphorus and sulphur, which had never been seen previously, and zinc, which had only been seen in one such second-generation star. They compared the amounts of each element to model predictions to learn about the nature of one of the first stars. Their work is the first to use COS on the Hubble Space Telescope to study the elements in ancient stars. These never-before-seen products of one of the first stars reveal that the particular star that introduced these atoms into space was likely massive, probably more than 20 times more massive than our own Sun, and exploded as a relatively faint supernova. At present, only the Hubble Space Telescope can collect the UV spectra needed to study these elements in ancient stars. These results foreshadow the exciting possibility of studying dozens or even hundreds of these ancient stars with the next generation of UV spectrographs on space telescopes, like the High Definition Space Telescope now under consideration by NASA. Authors of the study are Ian U. Roederer at the University of Michigan, and Beers and Vinicius M. Placco at the University of Notre Dame. The paper is available online here: http://iopscience.iop.org/article/10.3847/2041-8205/824/2/L19. Originally published by Marissa Gebhard at news.nd.edu on June 20, 2016.